We had several reasons to celebrate in the past few weeks. 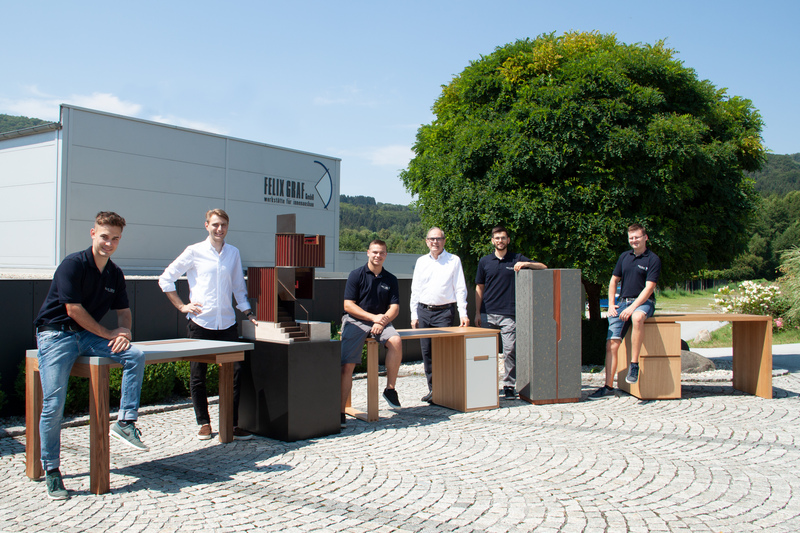 The four apprentices in carpentry Matthias Blöchl, Christoph Brzuske, Pascal Fechter and Valentin Graf performed excellently in their final examinations in the carpenter guilds Passau and Deggendorf and were raised to the status of journeyman. Felix Constantin Graf finished his studies in Interior Design at the renowned Royal College of Art in London receiving a Master of Arts. The four young journeyman showed their skills through craftsmanship excellence and an instinct for high quality design. Their grades and the quality of their test pieces reflect these. The master carpenters and skilled workers guided them well through their two-year in-company training programme. Matthias Blöchl, Christoph Brzuske and Pascal Fechter each produced a desk furniture for the final exam. On the basis of a juice bar, Valentin Graf presented an interplay of the fine wood of the Indian apple tree and a gold leaf and iron spatula surface and was thus able to achieve the highest grade in the practical test. With another one in the theoretical exam, he completed the dream mark and became the best graduate. High quality craftsmanship and fine design were also key in the Master’s project of Felix Constantin Graf, the design of a church pulpit. He was able to be shortlisted for the Head of Programme Prize at the RCA. “In recent years, we have deliberately invested in our apprenticeship programme and created conditions under which the young people can enjoy an ideal training period. I am very pleased that our own peers perform so well in the exams and hope that this will continue in the next few years. A review on the internship at Matteo Thun & Partners in Milan. In this interview, Felix Constantin Graf gives insights into his internship, which he completed at the renowned architect and designer Matteo Thun.